Should you invest in China's stock market? Know this one thing first. Despite incredible economic growth, it is not necessarily an investor's paradise. Weijian Shan is chairman and CEO of PAG, a private equity firm. He has been a partner of TPG, and co-managing partner of TPG Asia; a managing director of JP Morgan; a professor at the Wharton School of the University of Pennsylvania; and a farm laborer in China’s Gobi Desert in Inner Mongolia. He holds an MA and a PhD from the University of California, Berkeley, and an MBA from the University of San Francisco. He received no formal secondary education. Weijian Shan: 10 years ago I would say that the Chinese economy didn't really matter to American consumers and to American market. But as you saw, when Apple made this announcement, then their stock dropped 10%. The broad market came down about 3%. There used to be a saying in 1980s that when America coughs, the rest of the world catches cold. And today it seems to me that when China sneezes, that the rest of the world at least coughs. So it's relevant and it's important, and therefore it's important to understand it. 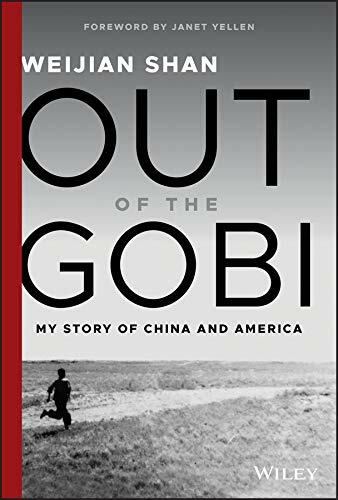 I think understanding its most recent history, as I explained in my book, Out of the Gobi, will be useful. You wouldn't want to get into a market without knowing anything about it. What is the most deceiving thing about China is that growth doesn't necessarily translate into profitability. If you look at the Chinese stock market, which started around 1992-- so by now we're talking about 27 years, right? And in that 27 years, China's economy has grown-- can you guess by how much? It has grown by 30 times in nominal terms. 30 times in 27 years. If you had invested in China's stock market from very beginning, 1992, and you have held your investment for all this years, never got out, during which the economy has grown by 30 times, how much money do you think you would have made as an investor? You will have lost money, right? People would ask why that is the case. Now there is not a strong correlation between the stock market and economic performance at any given moment. However, over a long period of time, let's say 20 years, in every country there is positive correlation between economic growth and stock market performance. And China is a single exception. You know, I've heard some investors telling me-- we're in the investment business. We are in private equity business, so we have many investors who trust us with their money to invest in Asia, particularly in China. They say well, China now is second largest economy in the world, America is the largest, and I allocate 40% of my capital to America, I should allocate at least 30% to China just by the sheer size of the economy. And I would tell them a story about how China has grown the past 20 some years and how the stock market would actually give them a negative return. And then you look into the question-- why that is the case? It has to do with China's economic growth model driven so much by investments. And therefore, yes, earnings have been growing in aggregate in China. But the capital base with which you produce the earnings has been growing even faster, because China has invested so much and therefore ROE, or return on capital, may be falling. If you don't understand it, if you invest just in economic growth, you will understand that there is a bad economy with a lot of overcapacity, and there is a good economy which is actually growing, then you're bound to make mistakes. China's stock market is just 27 years old. It's economy has grown 30x over that time. Imagine if you had invested early and gotten in on the ground floor. Actually, you would have lost money. Here's how that's possible.